1.3 The Schauder hierarchical basis. 2.5 Computing with refinable functions. 2.6 Wavelets and multiscale algorithms. 2.9 Duality, orthonormality and interpolation. 2.10 Interpolatory and orthonormal wavelets. 2.12 Bounded domains and boundary conditions. 2.13 Point values, cell averages, finite elements. 3.5 Interpolation and approximation spaces. 3.6 Characterization of smoothness classes. 3.7 Lp-unstable approximation and 0<p<1. 3.8 Negative smoothness and Lp-spaces. 4.2 Nonlinear approximation in Besov spaces. 4.3 Nonlinear wavelet approximation in Lp. 4.4 Adaptive finite element approximation. 4.5 Other types of nonlinear approximations. 4.6 Adaptive approximation of operators. 4.7 Nonlinear approximation and PDE's. 1. 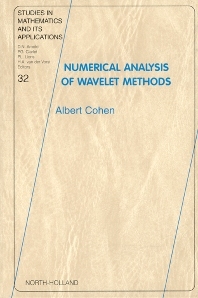 Self-contained introduction to wavelet bases and related numerical algorithms, from the simplest examples to the most numerically useful general constructions.<P> 2. Full treatment of the theoretical foundations that are crucial for the analysis of wavelets and other related multiscale methods : function spaces, linear and nonlinear approximation, interpolation theory.<P> 3. Applications of these concepts to the numerical treatment of partial differential equations : multilevel preconditioning, sparse approximations of differential and integral operators, adaptive discretization strategies. Academic researchers in applied mathematics (in particular: numerical analysis, partial differential equations, approximation theory, real analysis). Engineers and academic researchers making use of numerical simulation or image processing. "It contains an excellent presentation of the general theory of multiscale decomposition methods based on wavelet bases with a special attention to adaptive approximation."